Yep, I think Sony has a winner here. It's starting to look like it really has excellent bang for the buck. I want one. Answer from Bloom himself: "Well the first one is the AF101, then the F3 and then the FS100. I recommend downloading this file to see it at a better quality." These shots (at 3200) says it all especially when you consider the worst one is 2X more expensive. And, the cheaper one is more sensitive..Also look at the ugly oval bokeh on the expensive one. My favourite image from the unscientific low light tests was the 5D mark ll which looked to me the most filmic of the lot! Roll on the 5D mark lll I was actually quite surprised and got the cameras completley wrong. I'm not sure what you're comparing. The angle of view is different so you don't see the oval bokeh on the AF100. The AF100 clips the highlights more, which are variable anyway between takes anyway depending on how the match flares up. In the end the cameras have different specs and price, so you test them and find the one that suits you and your post work flow. To be honest, I don't think you can compare an F3 with S- log (which this test isn't, but the potential exists) to a 5DII other than one is cheaper than the other. The user comments on vimeo speak for themselves. 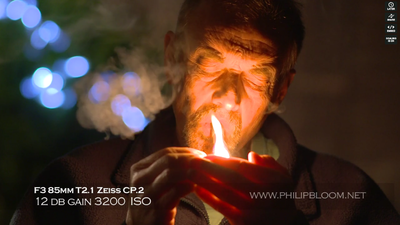 There is unanimous agreement that F3 & FS100 look best in this lowlight test. To be a fair test, it would seem to me that these cameras should be shot with lenses that provide a similar angle of view for the particular sensor size. An 85mm on the Canon 5d should be about 42 mm on the AF 100, and around 55mm to 60mm on the Sony F3 and FS 100 (estimates only.) Depth of field for the canon is shallower because of sensor size. Also, I don't see a reference to picture styles, etc.,. I think point of these tests is that all of these cameras can be adapted to low light shooting. So now, the question for me as a 5D/T2i owner is do I get enough out of the new rigs for my shooting needs, to change course. Not sure of the answer yet. I put the footage on my timeline and I have to say I love the F3 What I originally thought was over saturation is really lovely colour. For me though the price is out of my league. 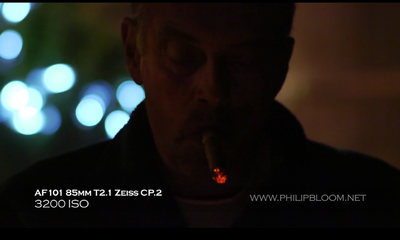 I think the FS100 is more in common with the Panasonic apart from low light where the panny has no chance. But the fs100 is minus the ND filters and other disabilities. I get the feeling this all going to change very quickly with new products and it might be an idea for me to hold fire for now. At this moment in time I reckon my EX1 with letus plus a future 5D lll is my best option as I can't have the F3. 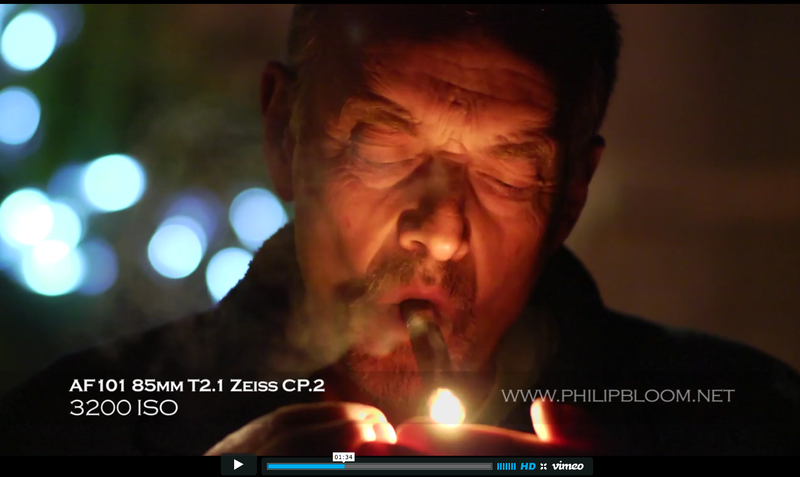 Still Phil Blooms tests may change all that.. I often wonder how and why I get hung up on cameras like I do but I'm not alone in this obsession and they certainly are not the passport to making great films by a long way.. I was watching calamity Jane today totally absorbed into a simple story more so than many low lit hard to see blockbusters with state of the art effects. Got to admire the camera makers getting me at it! "I think the FS100 is more in common with the Panasonic apart from low light where the panny has no chance." Look back at the pix I posted of the F3 and AF100 at 3200ISO. Which has more visible detail? It's the AF100. So where on earth do you get the idea the AF100 "has no chance." Since the AF100 delivers a great image -- more low light detail and far better handling of a high-lights (no blowing out) than the F3 at both 2000ISO and 3200ISO, there's simply no real-world need to spend 3X more. If you have the money, the F3 gives you bragging rights that you can capture an image without adding gain. But, to claim the AF100 "has no chance" in typical -- even extreme -- dark situations is to ignore what the test shows. And, the test isn't just about dark. The most interesting is how badly the F3 image disintegrates when the light gets too bright. It's a totally distorted image. Clipping highlights is one point that does gets commented on about the AF100. This particular test has too much variation, you can get major light level changes depending on how much the match flares up, so you're not comparing like with like between takes. At 3200 ISO the F3 match has a large flare up, while the AF100 doesn't. Mitch Gross at Abel Cine did a dynamic range test on the F3 and found it to be 12+ stops, which is the league of much more expensive cameras. What I mean't was the f3 can see better in the dark. That's not to say you couldn't get an excellent picture from the Panny which can see in the dark better than my EX1 probably. I have a set of zeiss mark one primes which are all t1.3 that I'd love to try and use on the Panny and I'm sure I could make beautiful films using the hdsdi out. In many ways I prefer the Panny as when your on a shoot you really need the camera to work for you not the other way round. I guess I'm sort of confused as things stand as to what camera I would choose they all have pros and cons. With an EX1 and adapter I can make lovely images in fact maybe better in my subjective opinion but the problem is you have a really long camera that takes time setting up as well as setting focus zoom on the EX1 and constant checking and then the focusing of the prime lens and sometimes forgetting the Letus is on or off. But you have all the EX1 tools at your disposal. In order to save time and make life easier I'm looking at options. I asked a lot of questions about the Panny and was concerned about some areas I think the fs100 leaves me again with extra work around the Matte box and to my mind at the moment gives a picture comparable to the Panny but with great low light capabilities and a bigger frame but as the panny is again meaning compromises and working around it then why not go for the 5D but then with all that extra work might as well stay with the EX1 and letus. Although could just buy the 5D because of its low light capabilites and work out a much compromised workflow with both cameras..
Yep this is all very confusing.. One step forward two back. Why do I need an outside recorder add ons and workarounds? Why can't manufacturers make a camera with 4.2.2 10 bit out or even a recorder on board that records decent bit rates at ten bit. If the cost is in the development surely a fully loaded camera will become a massive hit and sell loads of units. More sold means more profits and development and setup costs paid.. But then no one would upgrade in two years so another fail safe would likely be built in like a three year shelf life. . Heh heh.. I might sit on the fence too.. I think you should bear in mind that the current fashion is for modules and even the high end cameras are tending towards clip on external recorders, with an on board proxy recorder. All cameras involve working out a system/rig that works and increasing specs can put other people out of the price frame. In the end, you can't satisfy all the people all of the time. Mike, I think you really need to test drive some of these cameras before making your decision. I'm quite sure they will all considerably out-perform the Letus/EX combo in almost every respect. Web clips do not tell the full story and it's a shame to see decent glass not being put to good use.